My name is katlin and my boyfriend and i bought a little girl just a couple weeks ago. Her name is Tynawon (tiny one) and she is the weirdest little fluff ball. She has a big sister named Leela who is a bullock (bulldog jack russell) and they have the best time together. We are new to owning a chow chow and are just figuring out some of her traits, except one. we have noticed tyna will sometimes get up suddenly or I will put her down after carrying her down are long set of stairs and she will fall over. She doesn't seem to be in pain but her little limbs lock up and get stiff so she trips on them.We call it the "fainting goat". Never have owned a chow we weren't sure on whether it was a trait or not. She has a vet appointment with her big sister in a week or so but i'm just to curious to wait. That's not normal at all. Sounds like it could be something neurological? Definitely discuss this with the vet. That kind of thing is why responsible breeders do so many test on the parents, grandparents, and great grandparents; to make sure they're producing healthy puppies. And like I said, I'd discuss it with the vet; even if she does seem to be growing out of it. Yeah, thats an odd one. When i first read the post, i thought that she might be somewhat of an actress, lying down after being carried around and looking for some attention, but on further review, this definitely needs vet discussion. 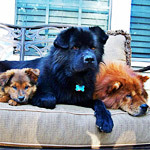 Not to panic you, but i have had older Chow who experienced seizures. Similarly, the legs and muscles would lock up and he would be disoriented afterwards. You need to make sure that she isnt have little mini-seizures. She looks good in the posted photos, and could be something really simple. My current dog has a really active tummy nerve. Scratch or rub anywhere on his lower half and the legs start running. Sorry for such a terrible description, hopefully you get the idea. Talk with the vet. Make sure that you aren't rushed out. Ask all the questions that you have. Write them down so you don't forget. I would ask your Veterinarian to refer Tynawon to a Neurologist to find out the cause of the problem instead of potentially being lead on to many revisits without answers. Hmmm.....I would definately take her to the vet just to rule out anything neurological. Now that Rory's dad mentioned it, I too had a chow that had seizures. He used to get stiff, put his head down to his chest and tip over. It took us a while to realize what it was. When I took him to the vet, he did it there and she said she wouldn't ave immediately thought it was a seizure except I had just got done describing why I brought him in right before it happened. Hopefully it is nothing in your case but in case it is seizures, they can prescribe medicine and also give you a home kit in case your chow has a grand mal seizure. We recently got back from the vet and he gave us some sad but not altogether horrible news. Tynawon is in good health other than her occasional "fainting". Our vet seems to think she is having "standing seizures". They aren't putting her on medicine quite yet because there is a good possibility she can grow out of them. She already has shown great improvement just since we got her at 8 weeks. Until she falls over and "paddles" her little feet she has a really good chance of growing out of all of it. Which makes us pretty happy. She's a happy somewhat healthy baby. I hope tyna out grows these episodes, will keep my fingers crossed for you all, and thank you for posting the results from the Vet. Sometimes a little info helps us all with our animals and where to start with their health issues. But a Vet trip is always the way to go.. I am glad you found out what the issue is and that she should grow out of it. Please keep us posted on how it turns out.